We’re a pessimistic bunch. Last year, pollsters asked people in 17 countries whether they thought the world was getting better or worse. 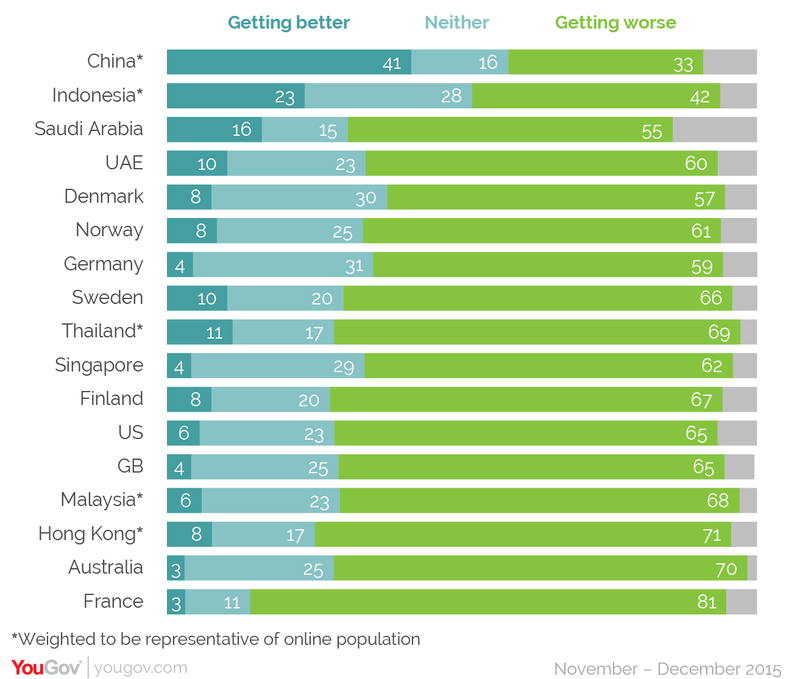 In all but two countries – China and Indonesia – more than 50% of people said things were deteriorating. In fact, in some places, as many as 81% of people said life was better in the good old days. Which is odd given that, by most measures, we’ve never had it so good. Take literacy rates. With more of us than ever before receiving a quality education, global literacy rates rose from 12% in 1820 to 83% in 2010. We’re also living longer. Other than in those countries affected by conflict, life expectancy has risen dramatically, and the 2000-2015 period saw the biggest increase in decades . 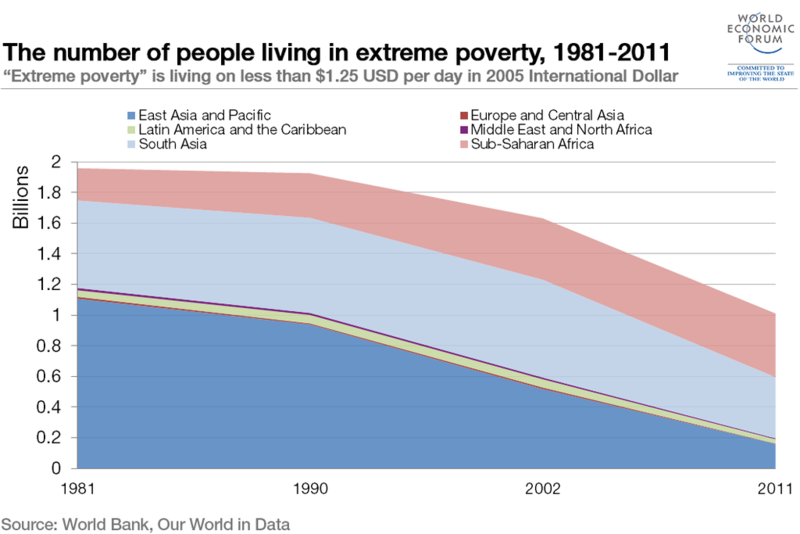 And while in the early 1980s 44% of people around the world lived in extreme poverty, in 2012 that rate was down to just above 12%. These developments are in large part thanks to increasing global trade, openness and connectivity. Which makes the growing discontent with the process that drives these trends – globalization – difficult to explain. Not since the Seattle Protests of the late 1990s has there been a bigger backlash against it. The fact is, for all the evidence that suggests we’re still on an inevitable march towards progress, many people have the distinct feeling that globalization has failed to deliver on its promises – that it hasn’t worked, at least not for all. And this chart adds some weight to their argument. It comes from Branko Milanovic, an economist who has spent decades researching inequality – and has been called the elephant chart because of its distinct shape. More importantly, it goes a long way to explaining the backlash against globalization. Along the horizontal axis, you’ll see the global population broken down by income distribution. Those towards the left are the poorest people in the world, while those further right are some of the richest – all the way up to the "one percenters" on the extreme right. The people around the global median are the developing world’s new middle class, and those between 75% and 90% are the working and lower-middle class in the developed world. Along the vertical axis is real income growth between 1988 and 2008. 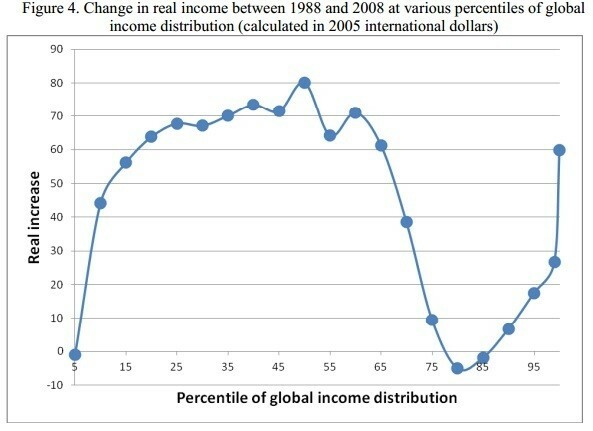 The higher the point along the plotted line, the more a group has seen its incomes rise. The shape of the curve clearly shows that the gains made in the past couple of decades have been very unequally distributed, with some winners – but many losers. “Globalization has benefited an emerging global middle class, along with the world’s top 1%. But people at the very bottom of the income ladder, as well as the lower-middle class of rich countries, lost out,” the World Bank points out . Have you read? Nobel-winning Joseph Stiglitz explains globalization in 3 minutes Globalization for the 99%: can we make it work for all?